I was really cynical about the event at first because I didn’t think we’d finish, but I take it all back! Everyone did their best! CONGRATS TO EVERYONE!!! So exciting! I went to bed when it was 97% and I really didn't expect it to be complete by the time I woke up. Great job to everyone! Thank you, everyone involved behind the scenes, for such a fun event! i fell asleep at 98% and i knew y'all could do it but wow!!! also out of curiosity will the clothing items that don't carry over become available after the beta ends in some other way? just wondering since it seems like a waste of pretty art otherwise. YAY Trout!!!!!!! A standing ovation for everyone involved!!! I thought this was a pretty great event and look forward to more great ones in the future! whoo, happy ending! thank you for the feedback response and i look forward to future events for this reason. 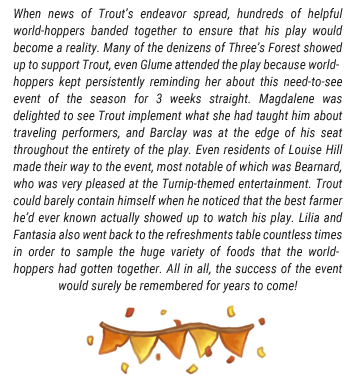 the items are fantastic and i look forward to seeing what happens with trout. the stats were also fun to see! i'm glad so many people got gold tier. Congratulations, everyone! The stats on that point spread is a little nuts - everyone in Gold Tier earned that top 25% prize, along with a few of the upper Silvers, too. Amazing! Congrats to everyone and looking forward to the next town!